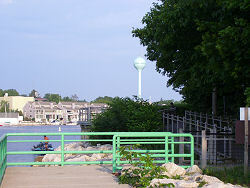 This narrow park is located on the south side of the Pentwater Channel. You must drive several miles around Pentwater Lake to reach this location, but it's worth the trip. Walk north on the level from the parking area toward the channel (there are several private driveways here also, but the park entrance is clearly marked with a sign). The rest room building is directly on your left. You come almost immediately to an interpretive sign about the Single Mill. Pass this and join boardwalk turning west past an interpretive sign about the Ferry and the Swing Bridge. Across from this on the channel edge is a deck with benches aroung the edge and a seating island in the middle. Continue on boardwalk ramping down to the cement seawall. You can walk to the end to the pier with a small jog to the south and back before the marker light. Interpretive Signs- "Railroads and the Eldred Shingle Mill" and "The Ferry and the Swing Bridge"
To reach Chester St. Park take Business 31 from the expressway to Pentwater (from the Oceana Drive exit you will drive through town; from the Monroe Road exit you will reach the turn before the town). Just south of town turn west on Long Bridge Road. Cross the bridge and go 2.25 miles to the end. Turn right on Ridge Road which becomes Chester St. The road dead ends at a turnaround in 0.7 mile. Parking for about 10 cars on the west side before the turnaround.